Plato; Aristophanes Four Texts on Socrates: Plato's Euthyphro, Apology, and Crito and Aristophanes' Clouds (Revised): Plato's "Euthyphro", "Apology of Socrates", "Crito" and Aristophanes' "Clouds"
Four Texts on Socrates: Plato's Euthyphro, Apology, and Crito and Aristophanes' Clouds (Revised): Plato's "Euthyphro", "Apology of Socrates", "Crito" and Aristophanes' "Clouds"
This book offers translations of four major works of ancient Greek literature which treat the life and thought of Socrates, focusing particularly on his trial and defense (the Platonic dialogues Euthyphro, Apology of Socrates, and Crito) and on the charges against Socrates (Aristophanes' comedy the Clouds). This is the only collection of the three Platonic dialogues which also includes the Clouds, a work that is fundamental for understanding the thought of Socrates in relation to the Athenian political community and to Greek poetry. Thomas G. West's introduction provides an overview of the principal themes and arguments of the four works. There are extensive explanatory notes to the translations. 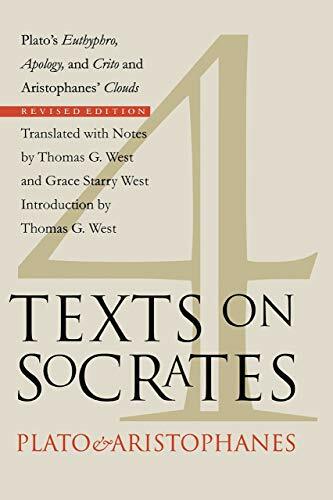 This is the only collection of the Platonic dialogues that also includes the Clouds, a work that is fundamental for understanding the thought of Socrates in relation to the Athenian political community and to Greek poetry. 9. Four Texts on Socrates: Plato's "Euthyphro," "Apology of Socrates," "Crito," and Aristophanes' "Clouds"